and yes, we should be looking after them. During times of heat, drought, and extreme temperatures, it really demonstrates how the planning of Canberra, ‘the garden city’, was based on serious misunderstandings. The last century or so, was very much an illusion. People arriving in Australia worked out that the temperature was variable, but that it always rained eventually. It was safe to plan cities on the European models as the climate was generous. This assumption led to the decisions that Australia could get away with planning its capital, a garden city, to be located inland by simply building dams to have enough water for the necessities, and still have enough to keep the gardens alive. This depends on it raining as much as it used to. Sadly it does not. Canberra is fortunate in having an abundance of trees. But over time strange decisions have been made. I can remember when a particular car park that I used to frequented in Woden (South Canberra area) was upgraded. The bases of the trees were surrounded with very limited catchment so I presumed that there must have been something else in place to allow for the catchment of any rain water. But oh no, I was wrong. Add to the lack of water catchment, that there has been very little rain and which has been accompanied by drought and extreme temperatures and what do you get on this site. Dead and dying trees. Some have mysteriously gone missing. In the nearby building complex is a series of parks that were very special to the area. But alas, these too have suffered through neglect. and a close up view of the above, reveals yet another tree down! Nearby is some public art. It is a good piece by David Jenz. On reading the plaque, I note that it arrived just as the surrounding areas have become vacated and the greenery neglected. It now looks a bit isolated. The building behind it is all boarded up. Trees, we need them. Trees I love them. Trees, we need to look after them. Trees, they are part of our green infrastructure. 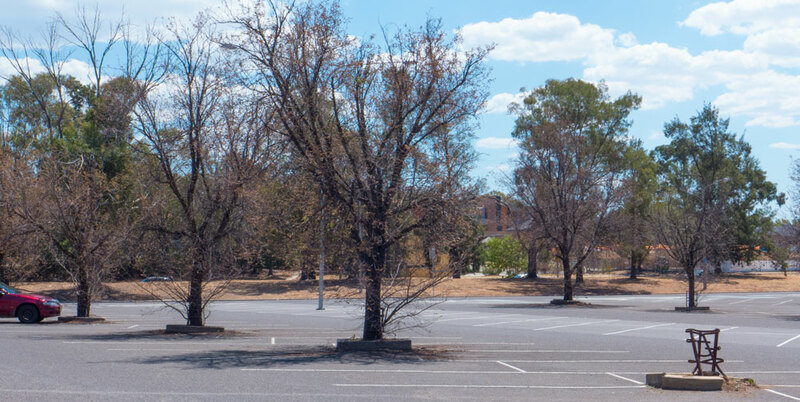 But who is neglecting the trees in this Woden car park and the adjacent centre?